Learn how to hand appliqué a show-stopping hexagonal block. 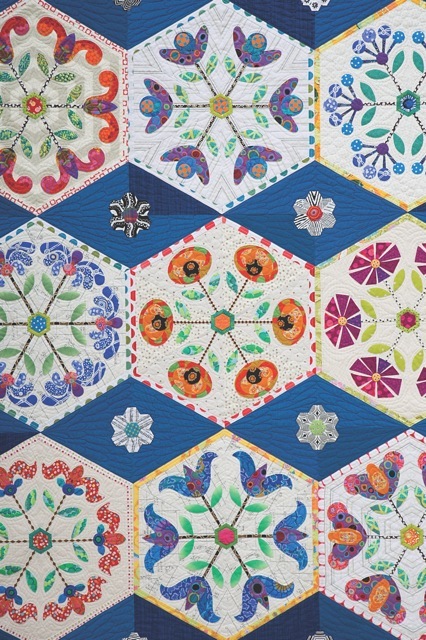 Use it as the centerpiece of your own small quilt.This class is suitable for confident beginners and beyond.Students will learn how to appliqué and trim to size at least one wedge that makes up the larger hexagonal block. A single class of 6 hours. Set aside the remaining fabric to use when you make your quilt. Shop Opportunity! Be prepared to sell any supplies that you like to use for hand appliqué, including scissors, pins, needles, thread, overlay vinyl, Essential Self-Adhesive Laminating Sheets, Thread Heaven, scissor fobs, and any kind of cute boxes or carrying cases for handwork. Make one block in advance to demonstrate how to trim the block to size. It is fine to fuse this block. Be prepared to demonstrate how to make templates and overlays. 1. Cut the templates free from the pattern page and make templates (p. 16). 2. Make a positioning overlay of the pattern (p. 17). 3. Students who do not have a 10˝ Clearview Triangle 60° Acrylic Ruler will need to make a wedge pattern (p. 7). 4. Prepare the block background (p. 16). 5. Teach cutaway appliqué on the stem (p. 19). Finger-press and use the placement overlay (p. 18). 6. Teach how to stitch outer curves and circles (p. 20). 7. Teach outer points, referring to The Best-Ever Appliqué Sampler (pp. 42–48), or use your favorite method. 8. Show how to trim the block and add the green block center using a block prepared in advance (p. 6). 9. Teach how to trim the block into a wedge using the Clearview Triangle Ruler or the template (pp. 6–7).